This entry was posted in Faith and Religion, History, Medieval Ireland, Popular Delusions, The Celtic Myth and tagged Catholic Church, Catholicism, Celtic, Celtic Christianity, Celtic languages, Celts, Central Europe, Christianity, Collectio canonum Hibernensis, divinity, faith, History, History of Ireland, Ireland, medieval Europe, medieval France, Medieval History, Medieval Ireland, Pat Kenny, religion, Religion and Spirituality, Saint Patrick, the Papacy. Bookmark the permalink. Thank you for this informed, well-researched response to that mind-numbing thing called ‘Celtic Christianity’ which still turns up here in Scotland and is living and breathing in North America! As a budding patristics scholar looking into canon law, such images of Insular Christianity as demolished here and projected elsewhere trouble me. Perhaps more scholars should write readable books…? 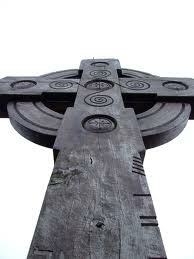 It puzzling how popular ‘Celtic Christianity’ has become. I am not quite sure as to its position within the various Christian religions; it does not appear to be Protestant or Evangelical, but rather some misunderstood quasi-Catholic branch, at least in the versions I have encountered. I find the desire to attach this ‘religion’ to the Churches of the medieval Irish(who weren’t Celts) rather curious, as there is ample evidence to illustrate how they endeavoured to be orthodox. Maybe you are correct in saying that scholars should produce material which is more accessible, that would be a good idea in general, but the simple fact of the matter is that those who have surrendered reason for faith are rarely swayed, even in the face of overwhelming evidence. i appreciated the facts but the cynicism is a little over the top and annoying. the irish call themselves “celts” because many of the celts came to ireland in the beginning of the iron age, actually bringing new ironworking technologyu to ireland and they blended in quite nicely and more or less seamlessly. also, i know that much of the neo-pagan stuff is over the top but can you please have a little faith (ooo, i know i just used the “bad” word) yes, a little faith in the fact that maybe some of the celtic neopagans actually understand that the celts werent that high on the spiritual pedestal that you belive they put them on. they knew of less planets, had a very confusing pantheon and many other things but the druids were exeptionally spiritual and wise, even if the commoners werent so bright. just think that maybe some of the celtic enthuiasts know more that a teaspoon on the subject and share your opinion. i just though your style was very condescending. It’s interesting that you focus on ‘celtic neo-pagans’, a group which I mention once in the whole piece, and even then, only tangentially. As the title states, I was discussing the myth of Celtic Christianity, especially that brand espoused by the interviewee noted in the post (unless this comment is a result of reading the other pieces I have written, which would make some sense). But, even so, it seems that one of the key issues was not grasped: the Irish are not Celts. It may even be argued that their never were any Celts. There is a family of languages called Celtic, but that doesn’t make their speakers Celts (try calling an English person German and see how well that goes down). There are certain material cultures associated with these language families, but again, that doesn’t make them Celts. The people who we call Celts may not even have recognised that they all belonged to the same cultural or linguistic origins. The medieval Irish and Welsh, even though their languages and cultures are, from a historic perspective, very similar, do not appear to have noted such similarities. Interestingly, if we were to judge the early medieval and prehistoric Irish by their material culture, we would assume them Roman, since more Roman material has been found in Ireland than so-called ‘Celtic’ material. Curiously, modern paganism has its roots in the Renaissance, its ‘Celtic’ aspect developing in the Romantic Movement of the 18th century. Those who invented it were less concerned with accuracy in their reinvention (or just plain invention) of ‘Celtic’ beliefs than with finding an alternative to Christianity. Such beliefs were based on Classical writings about Celtic-speaking peoples, and so very likely hold the strong bias of imperial Latin writers. I am led to believe that even the idea of druidism may an imposition of Roman perceptions on a culture (or cultures) they deemed primitive, and, since these druids didn’t leave anything for us to read, we know next to nothing about them, except what the Romans and, later, Christians, tell us; dare we trust them to be unbiased? In any case, thanks again for your comment! Well done!A very scholarly piece – just what is needed. My own humbler effort can be read at http://www.churchnewspaper.com/5687/archives .